C. Manual 20: Resource Adequacy Analysis: Periodic cover-to-cover review includes minor grammatical corrections and updated language to reflect implementation of Capacity Performance. Removes references to demand resource factor and deletes sections 5 and 6, which relate to demand-response reliability target analysis procedures and limited-availability resource constraint procedures, respectively. It would be effective with queue AF1, which opens April 1. Stakeholders will be asked to endorse a problem statement and issue charge centered on ensuring grid reliability during times of extreme stress. It would create a senior task force reporting to the MRC with a schedule calling for a task force recommendation by September and a FERC filing in December. The D.C. Office of the People’s Counsel has drafted an alternative problem statement and issue charge that would have stakeholders evaluate “energy” security rather than PJM’s focus on “fuel” security and would provide education on the roles of DR, renewable resources and energy storage in ensuring energy security. It also would require the RTO to provide a probability level of risk for all options and mandate a “rigorous cost-benefit analysis” for any rule changes. 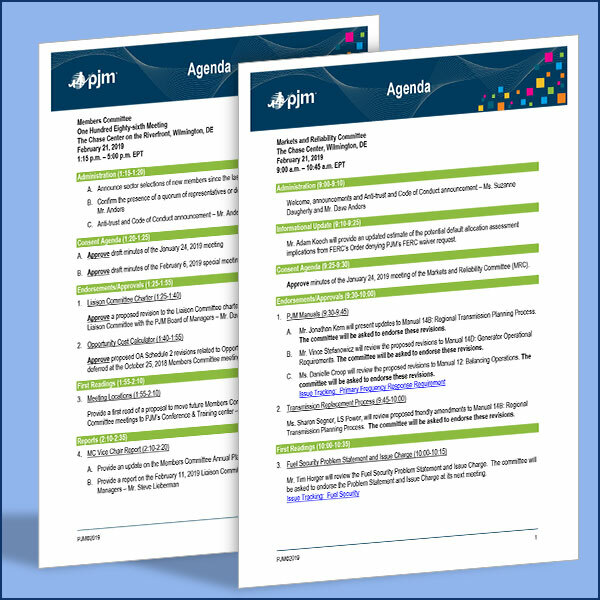 Members will vote on a proposal to move future MRC and MC meetings to PJM’s Conference and Training Center in Valley Forge, Pa.
A summary of the issues scheduled to be brought to a vote at the PJM Markets and Reliability and Members committees on Feb. 21, 2019.